Shujaa lost narrowly to Australia Sevens in the final pool B match of the of HSBC World Rugby Sevens Series at the Hong Kong Stadium on Saturday. With two wins in the pool against Spain and Canada, Kenya’s rhythm was stopped by Australia who stunned them with two quick tries and conversions for a 14-0 lead. Ian Minjire reduced the deficit with a try converted by Aden Agero. Agero also made his own try off a good feed by Collins Injera to bring scores level to 14-14 at the break. The Aussies went ahead again with two tries by Lachie Miller. Billy Odhiambo and Andrew Amonde struck late but it was not enough to undo the deficit as Australia went on to win 28-26. Kenya 7s finished a man down after a red card to Nelson Oyoo for a dangerous challenge in the air. 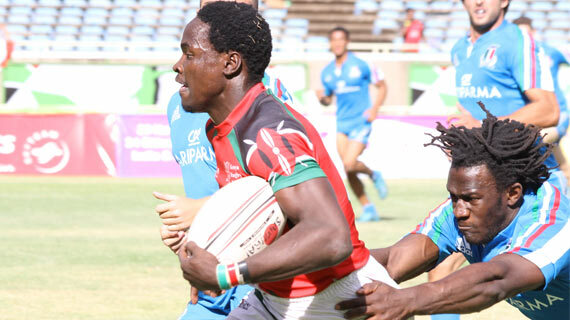 Despite the narrow loss, Kenya 7s finished top of group B to avoid a clash with South Africa 7s. Kenya 7s will now face Scotland 7s on Sunday at 7:07am in the 4th Hong Kong Sevens Main Cup Quarter Final game.